Toast the rolled oats under the grill, stirring frequently and watching closely. When lightly browned, blend the soy milk, vanilla, salt, and lemon juice. 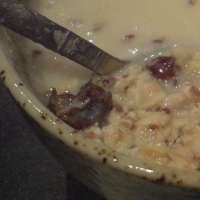 Mix well with oats, coconut, and raisins and place in airtight container and refrigerate overnight. Serve with honey, diced fresh fruit, or pecans.